YOU WANT TO GROW VEGETABLES? 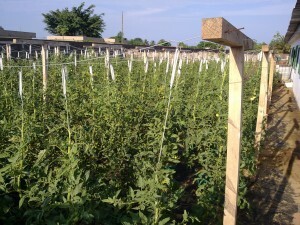 Growing vegetables in Ivory Coast is not easy: many diseases in soil will give problems. Thereby it is important that the plants have the right fertilizers and often we don’t know what is available in the soil. Due to these problems, the results (récolte) is often so low and of low quality, that it is almost impossible to make it profitable. 1) Because you grow in a pot, the roots will not go into the soil and you will have no problems with disease, nematodes etc. 2) Because you grow your plants in a pot with substrate, you can give exactly the fertilizer that the plant needs. 3) Because you give exactly what the plants need, the harvest will be higher and of a better quality. The start is very important; when you use good seeds, it is also important that these seeds can germinate under good and clean circumstances. The best way is to seed in “alveoles” with a good potting soil. In a good potting soil, all necessary elements are available in the correct relation. 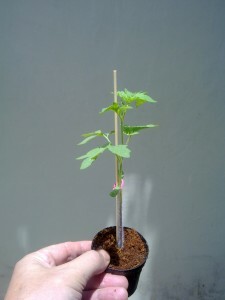 After germination, the “pepinieres” can be “rempoter” in small pots. You make a good selection directly (by size). The plants can grow further and if they are big enough, they can be “rempoter” in big pots. When the plants are big enough, they can be installed on their final place. 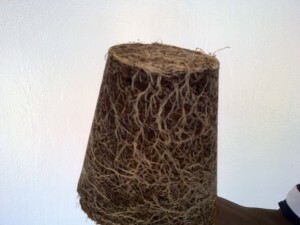 Because the roots stay in the pot, they will be more healthy and strong to give a good production. Step 1-4: From the beginning on, it is very important that the plants receives the right fertilizers (engrais), with the right elements. The types of fertilizers is changing during the culture: in the beginning we “make a plant” this is what we call “vegetative fase”. Later we want the plant to produce fruits and this is the “generative fase”. WHAT CAN AGRIFER DO FOR YOU? It is very important that the pot is not touching the underground and drains good. Therefore AGRIFER sells pots which are especially designed for horticulture: flexible, black, good drainage, long life (you can use for many years) of 6,5 litre. To seed, we sell potting soil which gives the best results and strongest plants. Also it is possible to use a fine coco-substrate. It is very important that the right selection is used for the best results. Besides the local seeds you can buy, AGRIFER is importer of one of the biggest Dutch producers of seeds, used in the professional horticulture. This is one of the most important issues from the beginning to the end. It is very important that all elements are available for the plant, so it can grow and produce in the right way. AGRIFER knows the needs of the plant and designed a special fertilizer which can be used together with a soluble Calcium Nitrate. With the fertilizers of AGRIFER you can supply all necessary nutrients to the plant: Nitrate, Calcium, Phosphor, Potassium, Magnesium, trace-elements as Iron, Sink, Cupper, Manganese, etc. To help the grower, AGRIFER will write a protocol with which the grower can work easily. Every situation is different, climates are different, irrigation water can be different etc. etc. and therefore a good contact with the customer is one of the important items for us.